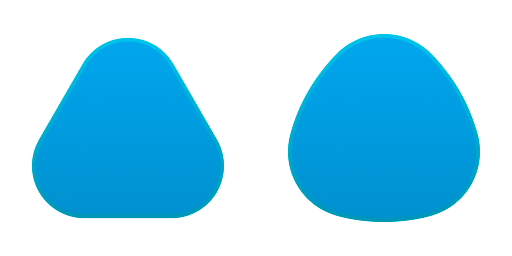 I know that the second shape is a squircle, but what are the other shapes called? Is there an actual name for them? "Trircle", "Triarcle", and "Pentircle" do not seem to be used for them, at least Google's image search does not provide any results. "Squircle" was a random mash-up someone somewhere came up with and it became trendy. But a square with rounded corners, is still a square. And a circle with any corner is no longer a circle. There are no specific names for the shapes merely because they have rounded corners. A triangle is still a triangle regardless of how round the corners may be. The defining factor is the number of sides, not the corners. Now you can try and start your own trend the way "squircle" is a trend.... invent your own names.... then use them constantly, repeatedly, in every way you possibly can. Maybe they'll catch on. Well, its true that a rounded triangle works. Except the sides are also not straight so you wouldn't know also sides are rounded. However there is a mathematical shape that exhibits this kind of form. And that is a Epitrochoid. However, Epithorcoids include quite a lot of other shapes too, so for example even the adobe logo is a 3 lobed Epitrochoid. Realistically speaking though we can not have a name for all shapes. So let us describe them instead of name them all. Answering after doing a bit of research prompted by a comment by Waruyama. It is not well known outside geometry and specific technical fields (they’re used in some engines, for example), and the name doesn’t hint at anything. Reuleaux polygons are very specific mathematical shapes with particular properties. You cannot simply take a polygon, curve the sides a bit, and claim it is a Reuleaux polygon—that would refer only to a polygon with very specific curves to the sides. Only polygons with an odd number of corners can properly be called Reuleaux polygons. So a squircle cannot be a Reuleaux polygon, no matter how carefully you curve the sides. And for that matter, those corners are sharp, not rounded. Though saying “Reuleaux polygon with rounded corners” might get you around that one. Finally, it appears that there is a company called Reuleaux that sells paraphernalia for vaping, and that tends to dominate search results, which will cause problems in understanding and discoverability. Since we are also not being very picky about our curves—they are not necessarily circular curves, really—we can generalize that term too. AAGD’s answer suggests “convex elliptical triangle” where an ellipse is a more general term for curves that include circles, so that is a step in the right direction, but then we also really aren’t necessarily referring to elliptical curves either (and this can also run into some confusion with elliptic geometry, which again look similar but are not quite these shapes). So I am going to suggest that we could use the term “convex-curve triangles,” and more generally, “convex-curve polygons.” Probably “with rounded corners.” That would cover precisely the shapes in question. It’s also basically unheard of. Google finds 6 results for "convex curve triangle". One is selling jewelry with stones cut into the appropriate shape, and another appears to be an art gallery with a geometric bent, and both are using the term to refer to the “trircle,” so at least we aren’t contradicting what little prior usage there is, but that’s not saying much. "convex curve polygon" gets 10 results, but they all appear to be highly-technical geometry research papers. Finally, I would note that the term that was most accurate for these shapes while still being within the realm of “people actually use this term” was “circular polygons,” from which we can clearly see the actual derivation of squircle: square-circle became squircle. Likewise, triangle-circle becoming trircle, pentagon-circle becoming pentircle or pentarcle or something, and so on. So while these names are not frequently used, as noted in the question, they are both accurate (as shortenings of the “circular polygon” terms) and a clear extension of the better-known “squircle.” So my conclusion, ultimately, is to echo filip’s answer, and suggest that these names are the best choice for regular use. Trircle, Squircle, Pentircle, Hexircle, Septircle? No, they probably have no names. Personally I would call them "triangle/square/... with rounded corners". As much as I like the word "squircle", I think that fitting the other shapes into an "ircle" would quickly get out of hand; additionally it feels like a very esoteric term. May I suggest puffy-rounded-triangle/square/pentagon/hexagon/heptagon/etc.‌​..? This way, the average Jane/Joe can understand what you are talking about as well. The term 'squircle' is understood because there is enough of each of the component words remaining, and it's caught on as it's nice and short, and fun to say. The same can't be said for trircle and the other contractions after that style. A common way to distinguish between members of a family that differ only in some number of something, at least in mathematics, is to use a numeric prefix. My name for the three sided version would be a 3-squircle. 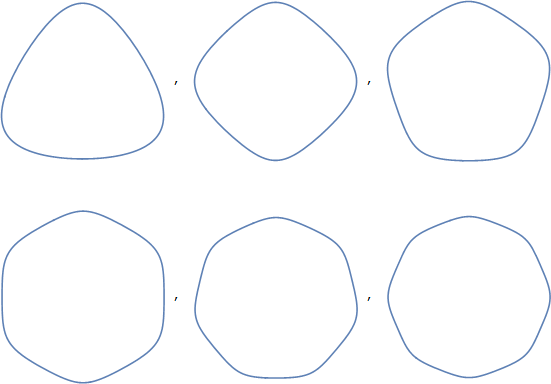 Part of the benefit of this technique is that I know everybody reading this answer, without exception, will be able to construct the unique name of any other rounded polygon squircle-like shape, regardless of the number of sides. There is obviously a glaring inconsistency. A squircle has 4 sides. However, the fact of that inconsistency indicates that we are using the term squircle in a different but related way, to describe the family of shapes, rather than the precise shape. The '3-' prefix, being so clear, obviously overrides the implied order of the shape. The numerical inconsistency, and the fact that it's glaring, also inject a bit of levity into the name, it's fun. If you were communicating about your design, you might use the term 4-squircle at some point, to emphasise its slight shift in meaning. Once the term squircle has been freed of the need to communicate the order of the shape, perhaps a new shape name could be constructed, like polyround, or circlegon - remember it's got to be a single word, not too many syllables, syllabic stress compatible with being easy to say, with roundness and sidedness clearly implied - a tough ask. So would I use '4-polyround' over 'squircle' or even '4-squircle'? I think not. 'Sidedround'? Maybe ... not. 'Roundygon'? Hmmm, maybe. Unless my eyes deceive me, the sample image that you provided does not exactly match this equation. I know that the second shape is a squircle, but what are the other shapes called? Is there an actual name for them? A lot has been written above in response about the specific shapes, particularly the "three-sided" one - less has been said about the general term/name for them. 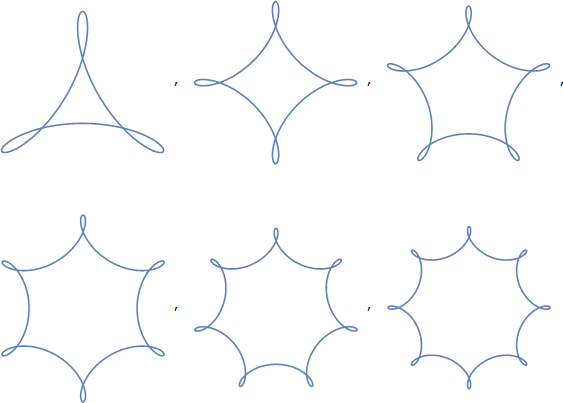 Reuleaux polygons, convex curve polygons, (n)-squircles have been suggested, but all suffer to my mind for not painting a visual image to the reader. Puffy-rounded-triangle helps me, but is specific to the three-sided one, and means a series naming system needs to be in place. It seems to me that the shapes are all: expanded, distended, bulging, inflamed, inflated, enlarged, dilated, bloated, blown-up, puffed up, puffy, ballooning, protruding, prominent, stretched, tumescent; tumid, oedematous, dropsical. So as a collective noun for them I suggest "tumids". This has a benefit of covering the regular (as in the original post) and the irregular (as not yet mentioned) puffy shapes. Not the answer you're looking for? Browse other questions tagged shapes terminology or ask your own question. How to resize vector masks without changing the size-ratio of round corners of it? What's the name of the web design pattern of showing the shape of content while actual content is loading? Is there a specific name for this square with two corners sharp and two corners rounded?